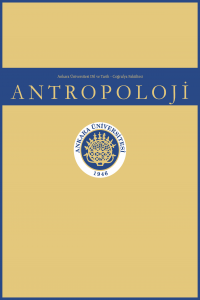 Anthropology (also known as Ankara University Faculty of Letters Anthropology Journal) is the first and only peer-reviewed journal for the general anthropological field in Turkey, firstly published in 1963 under the editorial of late Ord. Prof. Dr. Şevket Aziz Kansu. The journal still keeps it peculiarity of being the sole purely anthropological journal in Turkey. The journal accepts original research papers, review articles, case reports, translations, book reviews, scientific event reviews, biographies and various announcements and news. Anthropology is a local, periodical and a double blind-peer-reviewed academic journal. It is published biannually, first being in June and the second in December. The submissions are closed before 1,5 months prior the publication (April 15th and October 15th). The submissions after these dates are considered for the next issue. The manuscripts that completed their peer review and editorial phases are published online as "Early View" before the full June or December issues are published completely. At least two blind peers decide whether the submission made is worthy of publication. If one of the reviewers reject the submission and sees the manuscript unpublishable while the other thinks the contrary, a third blind reviewer will be assigned and the final decision is made according to the third reviewer's call. Shortly, in order to be accepted to publication, at least two reviewers should accept a manuscript. The editorial does not guarantee publication to all the submissions made to the journal. Unethical works or research out-of-scope of the journal can be rejected even before sent to reviewers. Likewise, submissions can be rejected by the editors even though the reviewers accepted them. Anthropology is an open access and a free of charge academic journal. All the published contents are open not only to academic institutions, but to everyone who has access to the internet. With open access policy, we aim to contribute to science and the scientific methods by our published research and to help people to be able to reach scientific information without stuck behind a pay-wall. Accordingly, all the published contents in Anthropology are licensed under Creative Commons Attribution-NonCommercial 4.0 International License (CC BY-NC 4.0). That means the published contents can be used elsewhere by giving appropriate credits and references. Briefly, the author(s) and reader(s) can reproduce and/or spread the published and/or electronic content in Anthropology, without any commercial purposes. The complete legal responsibility that may arise from the submissions to the journal and their contents belong solely to the authors. Anything demanded from the third parties in case of any violation of copyrights will not oblige Ankara University and/or the editorial of Anthropology to take responsibility. In such cases, all the academic, scientific, ethical and legal responsibility belong to the author or and/or authors. The manuscripts and other various submissions and related information/documents sent to Anthropology will be held indefinitely in the archives of the journal by the editorial for archiving reasons. Anthropology evaluates the manuscripts sent to be peer-reviewed by using various plagiarism software. In order for the manuscripts to be even peer-reviewed, the upper limit of similarity index is 20%. The review process of manuscripts having more than this value will be canceled. The author(s) must pay regard to the ICMJE (International Committee of Medical Journal Editors) recommendations and COPE (Committee on Publication Ethics) standards. All the published articles and other contents in Anthropology are licensed under Creative Commons Attribution-NonCommercial 4.0 International License (CC BY-NC 4.0). That means the published contents can be used elsewhere by giving appropriate credits and references. Briefly, the author(s) and reader(s) are free to reproduce and/or spread the published and/or electronic content in Anthropology, without any commercial purposes.